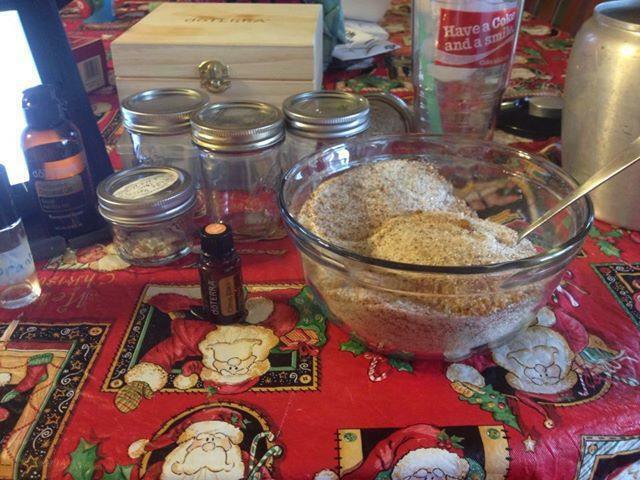 Last week, I enjoyed the wintery weather and mixed up some homemade sugar scrub. My skin has not been liking this cooler weather, and was hoping the sugar scrub would help. It sure did the trick. I have been using it on my body every evening in the shower. My skin is much smoother, and less itchy. Here is the recipe: For 3 cups of sugar scrub: 1 cup white sugar 1 cup brown sugar 1 cup coconut sugar 1/4 cup (approx) fractionated coconut oil 15 drops Citrus Bliss Essential Oil by DoTerra Combine all ingredients in a bowl. Mix in more coconut oil if too dry, one teaspoon at a time. Store in a glass jar. You don’t have to use all three types of sugar. You can use one, two or all three. Just adjust accordingly. I chose to use Citrus Bliss blend because it smells yummy and is really good for calming and uplifting the spirit. You can use any essential oil you love. Have questions about essential oils? Let me know. They have made a world of difference for my family. Here is my website to order from: http://www.mydoterra.com/midwifeshannon/ or contact me for more information!